Delightful B&B accommodation in two self-contained cottages, perfect for weekends, mid-week & short-term breaks. With their own separate entrances, each cottage comprises of a downstairs reception room and small kitchen area with a spiral staircase leading to a large double bedroom with an en-suite bathroom. Renovated sympathetically and to a high standard, the cottages are full charm and quirky features …but with the comfort of modern-day services, you won’t need to use the original ‘Wash House’ at the top of the garden! The large front garden provides ample off-road parking plus space to relax and enjoy a little al-fresco dinning! And from the bedroom windows, guests can enjoy wonderful views over the beautiful rolling countryside. With an eye for detail and distinction, each cottage has traditional, homely furnishings with large, comfortable beds made up with quality bed linen to ensure a good night’s rest! The small kitchen area provides all the basic facilities and equipment for guests to enjoy a little home cooking, and there is also free Wife connection and Freeview TV’s in each room. The kitchen will be stocked with fresh fruit, yoghurts, cereals, bread and fresh eggs (plus an array of condiments and sauces!) for you to enjoy a Continental Style breakfast at your leisure. A full blown English can be provided for an additional charge of £8.50 per person. 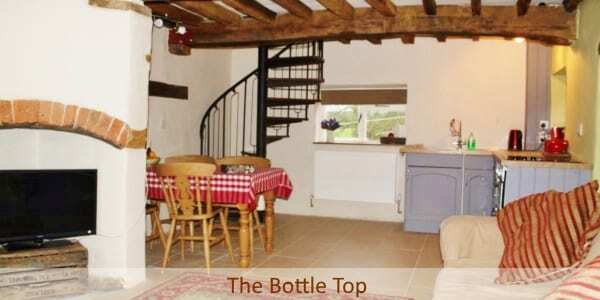 Dogs are allowed to stay with you in Crockery Cottage & The Bottle Top. There is a small extra charge of £7.50 per night per dog. If you are not sure which accommodation is best for you please give us a call and we can discuss all the options available for your dates.